The prints offer clues to our ancestry. In a cave in Western Spain, a series of prehistoric painted hands may offer clues to the mysteries of our human ancestors. Archeologist Hipolito Collado and his team have been exploring the depths of the the Maltravieso Cave in Cáceres in order to research and document some 57 painted hand prints found throughout the recesses of the tunnel, Agence-France Presse reported. “It's about making inaccessible art accessible,” Collado told AFP. The handprints belong to people who would have lived tens of thousands of years ago, and many of their art practices have long remained mysterious. One French prehistorian has a theory that painting the handprints was a form of sacred ritual, according to the same report. By creating 3-D scans all of the prints in a project called "Handpas," researchers all over the world who have studied handprints in other ancient caves will be able to add their own theories. Handpas has already produced an interactive map of caves in Europe where similar handprints can be found. The cave served as a shelter and then a burial place during two different periods of prehistory, according to a website for the region. 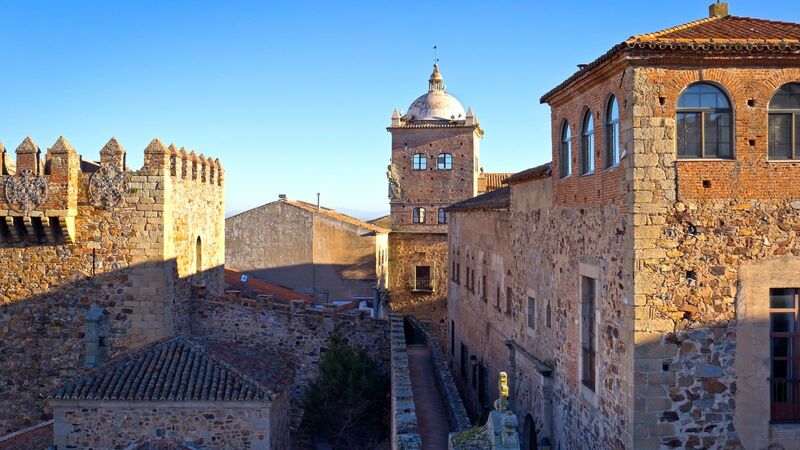 While the cave is not open to the public, the town of Cáceres is a great addition to any Spanish travel itinerary. Named a UNESCO World Heritage site for its blend of Roman, Islamic, Northern Gothic and Italian architectural styles, this cozy village is the perfect stop for anyone interested in the Renaissance.